From the makers of Bubble Witch Saga, comes a friendlier sequel for children, Bubble Witch Saga 2. 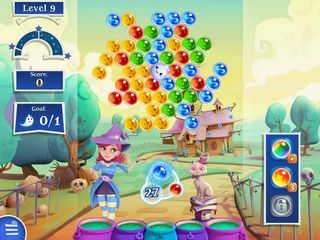 This cute game is great for the young at heart who love challenging bubble dropping games, magic, and colors. The whole thing is very cute. If you want a spooky Halloween scare, then this is the wrong game. Much fun will be had as you match up similar colored bubbles in strategic locations, aim cool bank shots, strive for point multipliers and try to free the animals. You can unlock things as you progress along using points you earn in game or buy making purchases with real money. Stella, the friendly teenage witch that the game centers around, has big eyes and a small nose, which is the opposite of the spooky stereotype of beady eyes and long warted-up noses. Her big smile is emphasized by her small chin. Even the cats have these adorable little faces. The whole thing is very cute. If you want a spooky Halloween scare, then this is the wrong game. This one is just for good, clean, fun. Stella’s mission is to clean up Witch Country of evil spirits by popping the dropping bubbles. 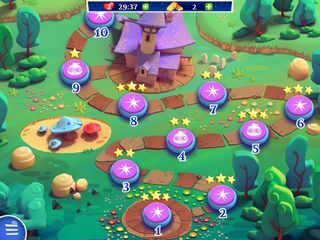 If you’re familiar with the game play of the first Bubble Witch Saga, then you might be relieved to know that this second installment of the series has done away with some frustrating features that were previously present. For example, there are no more point objectives as in the first game. They really were frustrating and didn’t really add positive challenge. If you like bubble dropping games, then you’ll find this one to be entertaining. Enough differences to make it new, but fundamentally similar to its predecessors, so you know what kind of fun to expect.